Here is a situation that happens to most golfers sooner or later. You are requested to mark your ball to the side of where it came to rest on a putting green, because otherwise your ball marker may interfere with a fellow competitor’s line of putt. You carefully mark the ball one or two putter-lengths to the side and then get absorbed in watching the line of other players’ putts and conversing with them about their good (or poor) attempts. When it is your turn to play, you replace your ball at your marker, forgetting to reverse the steps that were used to mark it to the side. This results in you playing from the wrong place. So what is the ruling? The player incurs a penalty of two strokes in stroke play or loss of hole in match play under Rule 20-7, Playing from Wrong Place, and must carry on playing their ball from where it came to rest or, if the ball was putted into the hole, they had holed out. If a competitor makes a stroke from a wrong place, he incurs a penalty of two strokes under the applicable Rule. He must play out the hole with the ball played from the wrong place, without correcting his error, provided he has not committed a serious breach (see Note 1). The Note 1 referred to above explains that a competitor is deemed to have committed a serious breach of the applicable Rule if the Committee considers he has gained a significant advantage as a result of playing from a wrong place. Obviously putting from a putter-length or two from where you should have is not a serious breach. In match play the player loses the hole as soon as they play from a wrong place. Q. In stroke play, A mistakenly replaced his ball in front of B's ball-marker (which was near A's ball-marker) and putted. The ball came to rest about one foot from the hole. The error was then discovered and A lifted his ball without marking its position, placed it in front of his own ball-marker and finished the hole. What is the ruling? A. When A replaced his ball in front of B's ball-marker and putted, he played from a wrong place and incurred a penalty of two strokes; the ball was in play — Rule 20-7c. When A then lifted his ball from where it lay about one foot from the hole without marking its position and did not replace it, he incurred the general penalty (two strokes) for a breach of Rule 20-1 — see second paragraph of Rule 20-1. Thus, A incurred a total penalty of four strokes. This is a good example of how not knowing a Rule of Golf can be costly in terms of penalty strokes. I have a useful tip that might help you to avoid this breach of Rule in the first place. When I mark a ball to the side as a courtesy to another player I immediately turn my putter upside-down and hold it by the putter head. I only ever do this when my ball marker has been placed to the side, so it serves as a trigger reminder for me to replace my marker when it is my turn to putt. I recommend this routine that has worked for me for several years now. My final point concerns how the player marks their ball to the side. It does not matter what method they use, providing the steps to move the ball or ball-marker to the side are then strictly reversed when the ball is replaced. This ensures that the ball is accurately replaced on the spot from which it was lifted. Christmas is approaching fast. Why not buy 3 or 5 copies of my book, ‘999 Questions on the Rules of Golf’ at big discounts, keep one for yourself to help you understand the Rules better and pass on the others to golfing friends and family as a low-cost gift that they will always thank you for. Click here for details on how to purchase on-line. "It does not matter what method they use, providing the steps to move the ball or ball-marker to the side are then strictly reversed when the ball is replaced. This ensures that the ball is accurately replaced on the spot from which it was lifted." Where is this addressed? Thanks a ton. When moving a ball or ball-marker to the side to prevent it from interfering with another player's stance or stroke, the player may measure from the side of the ball or ball-marker. 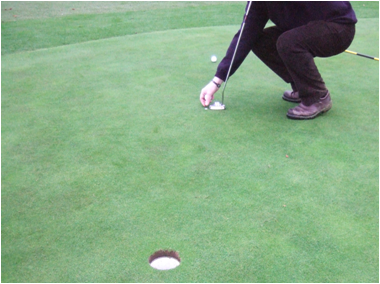 In order to accurately replace the ball on the spot from which it was lifted, the steps used to move the ball or ball-marker to the side should be reversed. Would you advise as to how to count the strokes? Am I correct in this? If you are on the green in 2, mark your ball to the side and fail to move the ball back to its original position, and then hit your ball towards the hole, are you now lying 5? Three actual strokes plus two penalty strokes and your next stroke will be stroke #6? Correct, in stroke play. Two penalty strokes for playing from the wrong place, Rule 20-7.